We have built a unique learning environment to create an optimal experience for your child. Our large rooms and well-thought-out classroom spaces allow children to feel comfortable exploring space and materials, and encourage interactions with others. There is a designated nap area, away from the regular classroom spaces. The toddler and preschool classrooms have small rooms adjacent to the main rooms as well as art studio space. Your child will enjoy active play in our large, fenced-in outdoor space that includes hiking trails, rolling hills, swings, climbing trees, willow huts and other small spaces, water and music elements and a vast array of gardens. Our space was recognized as an outstanding play space for young children in the book, Outdoor Playscapes by Rusty Keeler. To support your child’s creativity and well-being, we host visiting artists, musicians, and parent experts at the center each year. Weekly yoga sessions are now available for children in the toddler and preschool classrooms. In addition to programs for enrolled children, we host educational workshops for parents, students, and teachers. Experts have provided informative sessions on topics such as sleep, asthma, transitions, and developing healthy eating habits. We also hold a number of events each year, including new parent orientation, an annual fall welcome event, classroom potluck dinners, and quarterly Parent Committee meetings. 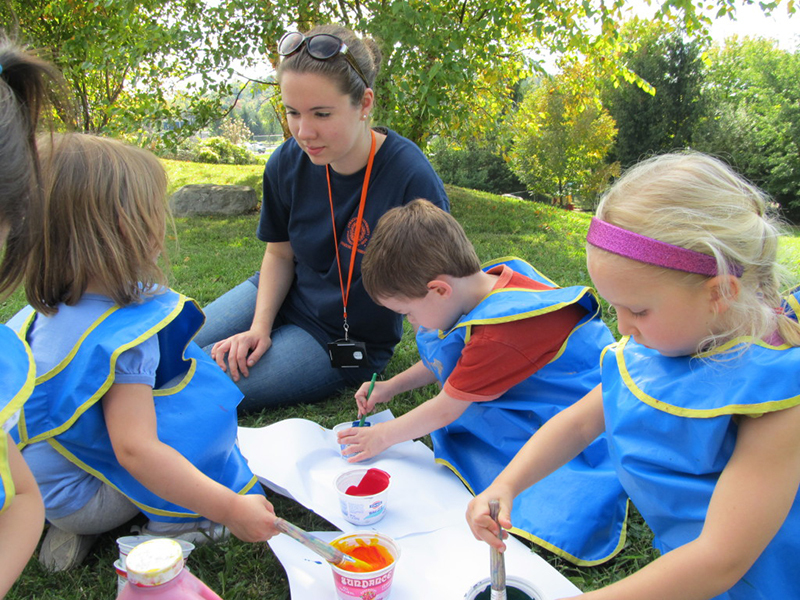 Be sure to take advantage of ongoing opportunities for parents to volunteer in the classrooms, on-campus explorations, and in our gardens.